https://farm5.staticflickr.com/4906/45746516291_071474e6d8_o_d.jpg https://farm5.staticflickr.com/4889/44832648375_7ece092ef7_o_d.jpg https://farm5.staticflickr.com/4827/44832648605_e5c5c79e32_o_d.jpg https://farm2.staticflickr.com/1902/44832648175_0e2d182ef2_o_d.jpg https://farm2.staticflickr.com/1951/45746515921_ec99d76612_o_d.jpg https://farm2.staticflickr.com/1947/45746515831_73be331d55_o_d.jpg https://farm2.staticflickr.com/1954/45746515651_08ea4a258b_o_d.jpg https://farm2.staticflickr.com/1910/45746515521_7d37269aaf_o_d.jpg https://farm5.staticflickr.com/4861/45746515531_0625d47d7f_o_d.jpg https://farm5.staticflickr.com/4827/45746515351_b245fbc9f4_o_d.jpg https://farm5.staticflickr.com/4832/45021602804_977b9413f1_o_d.jpg 【concept of design】 Environmentally-friendly tableware that can be purchased on the market can be roughly classified into a transfer and a telescopic type. And in the use situation, it is often encountered that only chopsticks do not have a spoon or fork, or need to be transferred in the use, They only noticed the convenience of the collection, but did not consider the appearance and ergonomics, so there was the production of dipper environmentally friendly tableware. The dipper designer is based on the concept of "environmental protection should be good, convenient without discount, health is fashion". We combine the elements of "Health X Eco X Fashion X Convenience" and design "Chopsticks + Fork + Spoon" 3 and 1, and easy to carry environmentally friendly tableware, and consider each person's familiarity and habits in the use of materials. 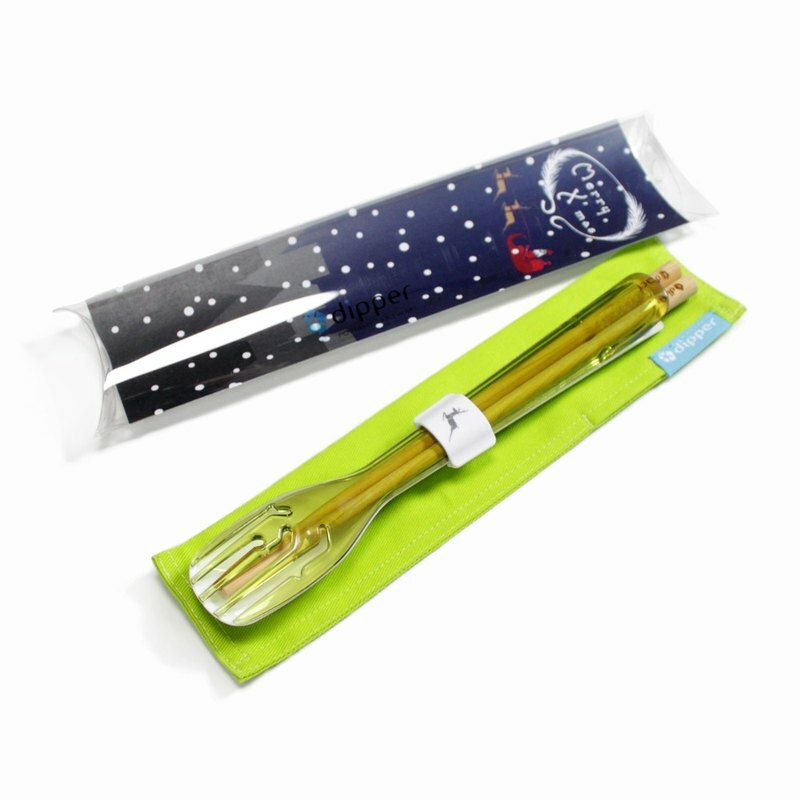 The materials used in the dipper chopsticks set are food grade resin, Taiwan Elm and other materials to choose from. It is super convenient to go to the night market, go abroad, and eat outside. You can eat peace of mind and do your part for the earth. 【design feature】 If you need to bring a plastic box with a pair of chopsticks, it is better to transform the upper and lower covers of the box into a fork and a spoon. 1. Fork, spoon and chopsticks are convenient and practical 2. Chopsticks can be used separately 3. Food grade resin, Taiwan elm and other materials are optional 4. Adhere to Made in Taiwan [responsive to environmental protection] Taiwan has about 9 million people dining out a day, plus the disposable tableware used for eating snacks. According to government statistics, it consumes several billion pairs of disposable tableware, which are obtained, processed, and transported. They are consuming the earth's energy and carrying environmentally friendly tableware. It is a way to protect the earth from the perspective of life. [Promoting health] Disposable tableware To prevent the mildew and the chemical used in the bleaching of the phase, It will often be released during the process of use, and it will have a considerable impact on our health. [Content material size] Chopsticks: 202x7.8x7.8mm, natural eucalyptus without painting Spoon: 196x33.4x14.7mm, food grade TRITAN can withstand high temperatures up to 110 ° C Fork: 196x33.4x9mm, food grade TRITAN can withstand high temperatures up to 110 ° C Elk fastener: 24.5x18x12.5mm, food grade resin Cloth cover: 50x223x2mm, twill weave Christmas back card: 220x57mm, coated paper [Intimate reminder] 1. Due to the different resolution of the screen, the color of the picture is slightly deviated, so the color of the product is subject to the actual product. 2. The goods are personal hygiene products, which are not returned or exchanged after being opened or used. 3. The product is a reusable food device. 4. The product can be used for washing dishes (baked bowl). 5. Items should not be placed in a microwave or oven. 6. Do not use a melon cloth or a pot brush to clean the product during cleaning to avoid scratching the product. 7. Storage: Place in a dry place.